The megger insulation tester is an instrument used for measuring high resistances of the order of mega ohms and for testing the insulation resistance. 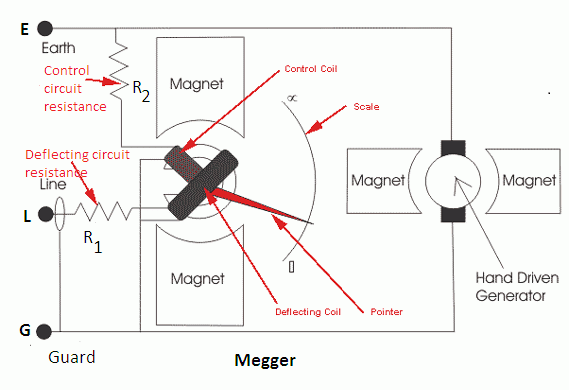 Megger working principle is based on the working principle of moving coil instruments, which states that when a current carrying conductor is placed in a magnetic field, a mechanical force is experienced by it. The magnitude and direction of this force depend upon the strength and direction of the current and magnetic field. It consists of a hand driven DC generator and a direct reading ohm meter. There are two coils PC and CC which are fixed together at some angle and are free to rotate about a common axis between the poles of a permanent magnet. The coils are connected in the circuit by means of flexible leads (or ligaments) which exerts no restoring torque on the moving system. The current (or deflecting) coil is connected in series with a resistance R1 between the generator terminal and the test line terminal. The deflecting circuit resistance R1 limits the current and control the range of the instrument. The pressure (or control) coil is connected across the generator terminals in series with a compensating coil and protection resistance (or control circuit resistance) R2. Compensating coil is connected to obtain better scale proportions. 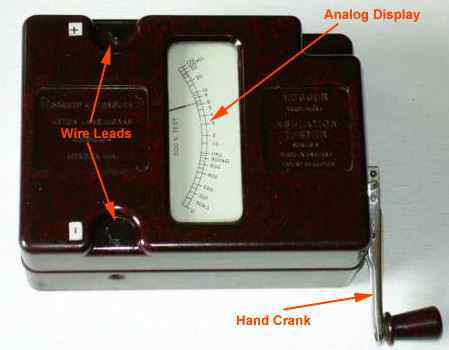 A guard ring is provided to shunt leakage current over the test terminals or within the instrument itself. The terminal ‘G’ known as guard terminal is provided by means of which the guard ring can be connected to a guard wire on the insulation under test. The test voltage generated by the generator is usually 500 or 1000 volts. Step 1. When the test terminals are open, the resistance to be measured is infinite. In case the generator handle is rotated, the generated voltage sends current through the potential coil and no current flows in the current coil. Therefore, the moving system rotates in such a direction that the pointer rests at infinity end of the scale. Step 2. If the test terminals are short-circuited and the generator is operated, it sends a large current through the current coil and a very small current flows through the potential coil. Therefore, the resultant torque so produced turns the pointer to zero end of the scale. Step 3. If the unknown resistance to be measured is connected between test terminals, an appreciable amount of current flows in both the coils. The actual position taken up by the pointer depends upon the ratio of currents in the two coils i.e. upon the unknown resistance. When a magger is showing zero reading, it means the unknown resistance, which is being measured, has very low value. If it is showing zero value while measuring insulation resistance, it is an indication of insulation failure or short circuit. Whereas, when it is showing infinity reading, it means the unknown resistance, which is being measured, has very high value (or open circuit). Thanks for reading about megger working principle. If you liked this post, please share. #1 Which of the following instruments can be used in ac bridges for low frequencies up to 200 Hz only? #4 Which of the following instruments can be used in AC bridges for the frequencies up to 100 kHz? #6 . Capacitor type potential divider is used to extend the range of which type voltmeter? #7 . Which of the following frequency meters can be used for the measurement of radio frequency? the supply voltage is 220 V.
#9 Which method can be used to measure the power in a three phase unbalanced load system? #11 Highest flux density exists inside which of the following instrument? #14 Which of the following instruments does not use the effect of current for measurement purposes? #16 . Which of the following instruments will be suitable for the measurement of temperature of a furnace? © http://www.yourelectricalguide.com/ construction and working principle of megger.